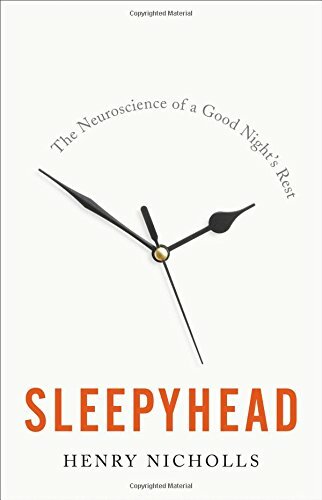 This popular science book is part memoir and part examination of narcolepsy and other sleep disorders. Nicholls himself has narcolepsy, and he examines a variety of sleep disorders, especially sleep apnea. He says that, unexpectedly, writing this book helped him dramatically improve his own sleep problems. In the process of research, he found that he also had catalepsy, which means he is prone to seizures that include a loss of sensation and rigidity of the body. It turns out that narcolepsy and catalepsy are frequently associated with each other. Nicholls is a talented writer who combines personal stories and anecdotes from science with an examination of classic work in sleep science and recent research. While there are many books on the importance of sleep and with theories about how to sleep well, they tend to be rather similar. Sleepyhead is distinctive in addressing scientific studies and issues that don't get included in the more standard fare. It covers neuroscience, genetics, brain studies, and many clinical case studies. So this book will provide information that will be new to readers even if they have read other books on sleep. Not all topics get equal treatment. Nicholls dismisses the interpretation of dreams in 2 pages, citing evidence that dreaming is more likely a side effect of REM activity, and probably does not itself perform any important functions. He allows that dreams may be meaningful but does not put much store in the process of trying to interpret them. But Nicholls does take an open minded approach to understanding the spectrum of states below full consciousness and to the treatment of sleep disorders. He even cites evidence that practicing with a didgeridoo for half an hour a day can be effective in treating sleep apnea. So Sleepyhead is an engaging book full of facts and good stories. It gives a complex view of sleep disorders and the science of sleep. Recommended. The unabridged audiobook performed by Henry Drury is performed with energy. It does not have the endnotes, but is a good way of consuming the book.